Showing 1 to 24 of 24 job(s). Cat Analyst. Global Insurer is seeking a Cat Analyst with 3-5 years of cat modeling experience to join a growing team. Experience with RMS is ideal. Eastern or Southeast Regions. Pre-ACAS Commercial Pricing. Multi-line P&C company is looking for a Pre-ACAS with 2-4 years of P&C experience. Commercial lines pricing is ideal but not required. Eastern Region. ERM Data Analytics. Excellent opportunity for a Pre-ACAS or Non-Actuary with 2+ years of P&C insurance experience to learn ERM. Candidates need strong SQL experience and good communication. Eastern Region. Commercial Lines Pricing. Pre-ACAS or new ACAS with 4+ years of P&C experience needed. Great opportunity to work closely with underwriters and lead projects. Ideal candidate will have commercial pricing background and knowledge of SQL or SAS. Eastern Region. Actuarial Financial Planner. Our west coast client is seeking an FP&A actuary to lead their capital management, expenditures, planning, etc. This individual will play a key role in finding opportunities for growth, implementing new systems/dashboard reports, and analyzing current/past trends in KPIs. Experience and knowledge of SQL is required. Actuarial candidates with ACAS or FCAS are ideal but actuarial experience is not required. Southwest Region..
Commercial Pricing Actuary. Seeking a commercial/specialty lines pricing actuary with strong skills in VBA and SQL. Ideal candidates will have 4-8 years of experience, and be at the new to near-ACAS level. Northeast Region. Startup Opportunity. Late-stage commercial lines startup is looking for a Pre-ACAS with 4-6 years of pricing experience. This is an unique opportunity to join their fast paced growing company. Eastern Region. Reinsurance Actuary. Work cross-functionally with Underwriting, Claims, Financial Services and Management to complete annual reserve studies and results monitoring for specified reinsurance profit centers. Eastern Region. Pricing & Reserving Opportunity. Specialty Insurance company is looking for a P&C actuary 3-7 years of experience for a commercial pricing and reserving role. Candidates with strong commercial pricing are ideal. Eastern Region. Commercial Lines Pricing Actuary. Our client is seeking a pricing actuary with 3 years of experience and 3+ exams to coordinate and conduct analyses on rate levels across various lines of business and states in addition to working with underwriting to analyze impact of pricing changes. Ideal candidates should have 3+ exams passed and technical expertise. Midwest Region. Pre-ACAS Commercial Pricing Opportunity. Our client is looking for a Pre-ACAS with 3-5 years of P&C experience for their team. Open to candidates with reserving or personal lines pricing experience. No visas. Eastern Region. Predictive Modeler. Seeking analytics professional with 3+ years of modeling experience for a Commercial lines analytics role. Pricing experience preferred, but not required. Ability to scrub, clean and structure data that you will use to build models. Midwest Region. Data Scientist. Develop/monitor models used in multivariate analysis, linear modeling and data mining. Includes development of predictive risk models as well as communication of technical concepts to senior leadership and other non-technical staff. 4-10 years of experience and Workers Compensation desired. Midwest Region. P&C Consultant. Seeking talented and motivated actuarial professionals for growing P&C practice. Consultants will work across several functional areas including long-tail commercial reserving, coding, and pricing. Ultimately will manage large accounts and serve as the primary client contact. Data Science backgrounds are also attractive. Ideally in the 2-5 years of experience range. State Product Manager. Seeking a strong leader for an innovative Product Management role. Will have responsibility for managing products for one or more states. Highly visible and creative role where you will work with senior leadership across the organization. Actuarial background a big plus, but not required. 10+ years' experience. Northeast or Northwest Regions. Reserving Opportunities. International P&C insurance company is seeking two reserving actuaries for their team. 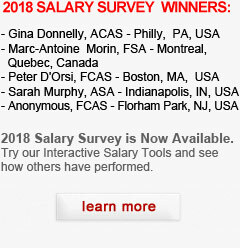 New ACAS or near ACAS candidates with strong SQL are ideal. Eastern Region. Consulting Opportunity in R. Do you have R Programming experience? Top consulting firm is looking for a Pre-ACAS with 1-3 years of experience who can program in R. Eastern Region.